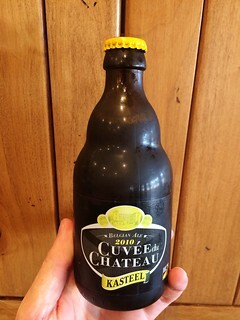 This style of beer, a Belgian Quadrupel, admittedly isn’t one of my go-to drinks, as I’m a fan of mostly clean, lighter beers (usually German), but as a certified BJCP judge I need to practice with all styles, and so, I present to you this review of the 2010 Cuveé du Chateau by Kasteel. I love Kasteel’s Rouge, probably my favorite fruit beer with its heavy dose of cherry extract, so I recognize I’m biased heading into this tasting, expecting to be at a minimum pleased, which is contrary to some homebrew tasting gauntlets where I assume I’ll leave more dissatisfied than when I arrived. Expectations are a real factor in all judging scenarios, so I find it important to note. The Cuveé bottle is absolutely beautiful – short and stout but very curvy and elegant, in the style of many other Belgian beer bottles, which elicits wine-tasting thoughts as much as beer. I inspect the bottle looking for some information on the style or flavors I should expect but all that is present is the obligatory note to make sure I’m not pregnant before enjoying, and the all-important power indicator of this fuel, 11% ABV. 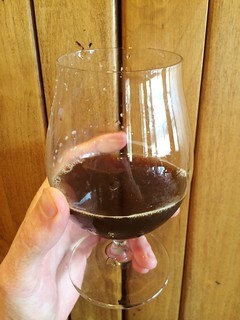 Upon pouring, I first note the color – it is much darker than I expected, beyond copper and solidly in the brown category, but not a vibrant “beer” brown that’s achieved through varying degrees of toasting barley, but rather a duller tree bark brown, most likely a condition of its five years of age. Again, I’m thinking about wine – some big reds like cabernet actually take on brownish hues after many years. I notice that the beer is pouring with high viscosity, and there is very little visible carbonation. The head produced from pouring is light, just a thin ring of very persistent off-white bubbles clinging to the edge of my favorite Spiegelau bulbed pilsner glass. Perhaps this low level of carbonation is intended, but I think it’s more likely that the beer has lost some CO2 over its lifetime. I stick my nose deep into the glass and expect to be knocked over with a billowing, complex aroma, but the intensity of the aromatics is actually quite muted. With more searching I first note fresh tobacco, following by plum notes and a breadiness that’s becoming more noticeable as the beer warms. Again, this aroma is not unlike that of an aged cabernet or other deep, red wine, but with more bready & yeasty character. I continue to detect more aroma overall, including a very light “funk”, somewhat like an organic topsoil earthiness, and a mixture of cinnamon-spice and pitted fruit aromas of peach & apricot. At last, I taste the beer. I wasn’t sure what to expect for its flavor, since, like in wines, the aroma doesn’t necessarily need to match up with the taste. From the nose one would expect some degree of sweetness & fruitiness in the flavor. The actual flavor however is not fruity at all, but rather very malty, grainy & thick, and extremely dry. The complex alcoholic flavors of blackberry & black cherry really come into play in the aftertaste and as the beer loses some of its initial chill in my mouth. Several more sips pass and I realize I’m drinking something completely different from the flavor profile of Kasteel’s middle-aged, sweet & sour Rouge. This is instead an elderly beer trying to hang on. I am impressed however at the lack of alcoholic heat from at 11%; the alcoholic profile has developed into more pleasing, complex flavors & aromas. The structure of the beer is as huge as it appeared when pouring, full & heavy. The oxidative characteristics are much more restrained than expected, and the astringency is pleasingly low for such a strong beer. The aftertaste is mostly alcoholic, but it terminates quickly and doesn’t linger. So, this 11% Quad is definitely one that you’ll drink slowly, not because it’s so “hot” that you’ll burn your throat by drinking it too quickly, but because it’s so dense and dry that small sips are the only way to experience the depth of its flavor. In comparison to other Quads on the market I see the benefit of age – that caustic alcoholic profile is all too present these days with breweries rushing their strong beers to market. It’s important to note though that this big Belgian beer that drinks more like a barleywine than a traditional Quad because of its extreme age (for beer, five years is forever). This 2010 vintage has aged well but perhaps for too long, and I think about what it was like in a younger state, when it was a bit sweeter, probably to the benefit of the beer, but possibly with a less pleasant “hotter” alcohol profile. I conclude that this is a fun beer, not one of my all-time favorites but one that I’d get again and prefer to bring out with friends towards the end of an evening of drinking once our palates have already been elevated by other higher-alcohol drinks. If, however, you’re in the market for a true Quad, I’d probably recommend the Rochefort 10 or St. Bernardus 12, and if you’re looking specifically for a 5-year or older beer, I’d most likely steer toward an English-style barleywine, like the J. W. Lees Harvest Ale. Make sur to check out Jeff’s facebook page. will help to save much time and will provide you with the chance to avoid the hassle getting money from the bank.